When it comes to de-identification, you can’t apply privacy or data protection law, or assess project risk, until you first understand the relative merits and limitations of different de-identification techniques. There are detailed, lengthy guides available for statisticians and data scientists, but what if you want something more accessible as an introduction? 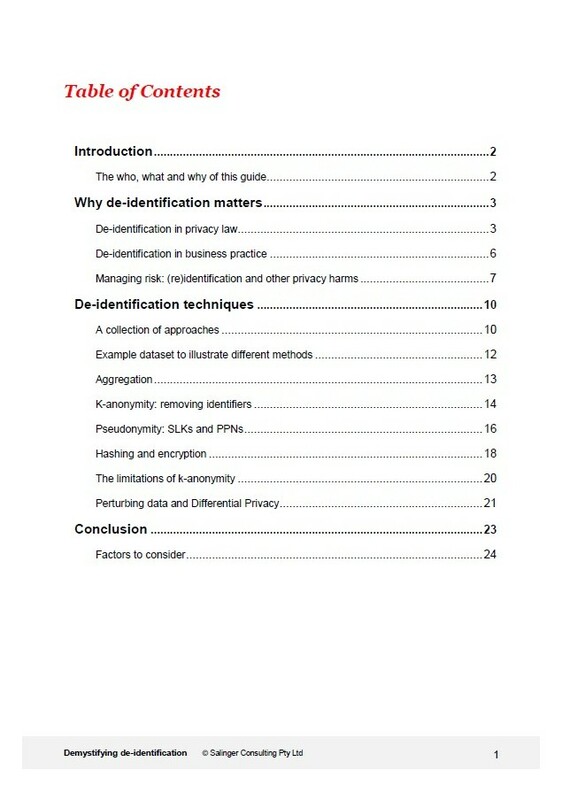 A checklist of factors to consider for any given de-identification proposal. 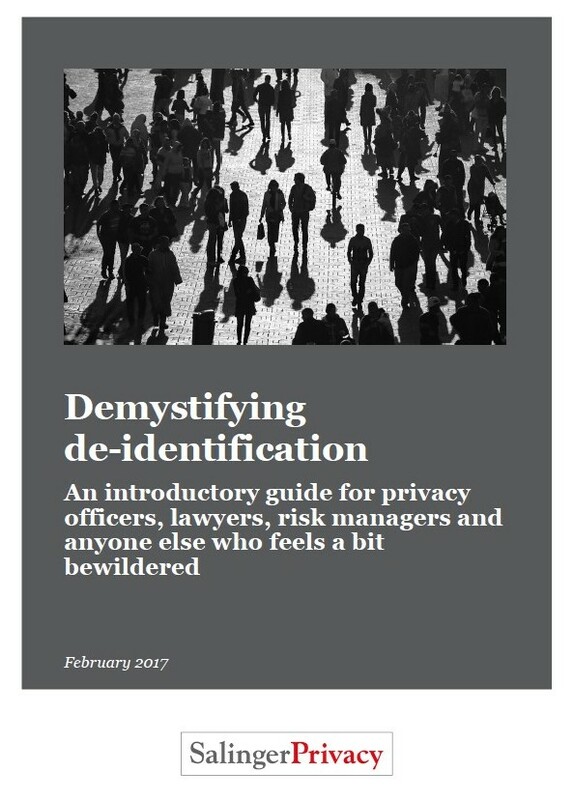 If you want to understand how de-identification fits into privacy or data protection law, a simple illustration of how each different technique works, and a plain language overview of the strengths and weaknesses to factor into risk assessment considerations, this guide is for you. Our guide provides a useful introduction to the topic in any jurisdiction. Updated October 2018: This third edition has been updated to include new resources published since our first edition in 2017, including guidance from the National Health & Medical Research Council, and the Office of the Victorian Information Commissioner. 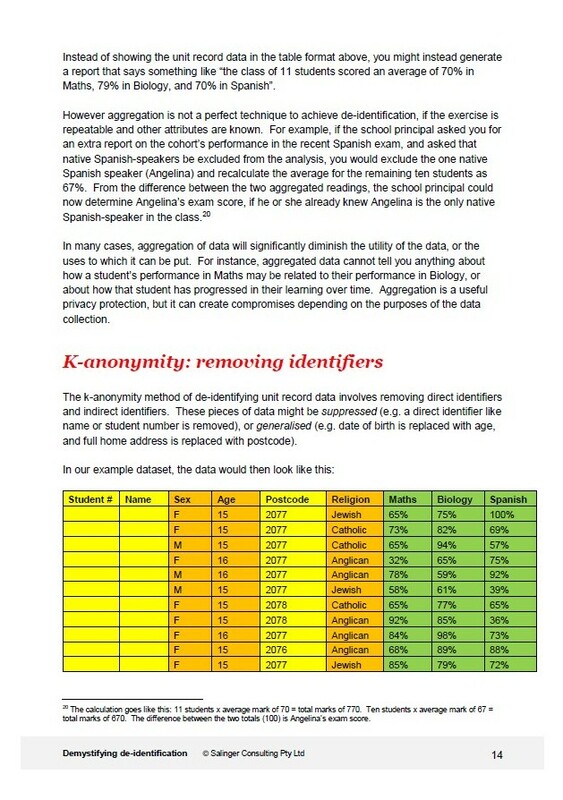 Click below to purchase Demystifying De-identification. Alternatively, this eBook can be included along with other resources in one of our value-packed Compliance Kits. We accept credit card, debit card or PayPal. Questions? See our eBook FAQs. “Salinger Privacy is extra-ordinarily effective at integrating law, technology and compliance to provide practical guidance. A handy guide to help you untangle the complexities of privacy law. Our consulting clients often ask us to advise on a seemingly simple question: Can we disclose this? In reality, the question is: Can we disclose X type of information, to the recipient Y, in circumstances Z? Finding the answer amongst the tangle of privacy principles, exemptions, exceptions, case law and interpretations offered by the Privacy Commissioner can be frustratingly complex. For example, in NSW privacy law there are thirteen differently-phrased exemptions relating to disclosures for law enforcement and investigations alone! Some rules only cover health information; some cover personal information but not ‘sensitive information’; some cover ‘transborder’ disclosures, but others don’t. So how do you find your way through all the principles, exceptions and exemptions? Untangling Privacy is designed to help you quickly navigate your way through the NSW privacy laws. It is relevant for private sector organisations and State-owned corporations regulated by HRIPA, and NSW public sector agencies (including universities and local councils) regulated by both PPIPA and HRIPA. Untangling Privacy offers a set of six visual flowcharts, with yes/no answers determining your path, to quickly guide you through the Disclosure principles – and all the exemptions to those principles – that apply in NSW. It reflects the amendments to PPIPA which commenced in 2016, including the transborder rule, and the new statutory guidelines on research. 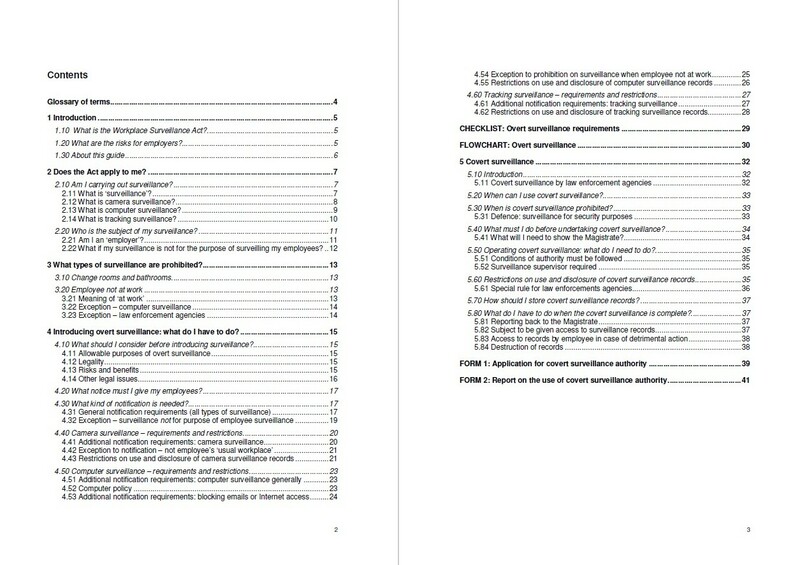 Untangling Privacy works as a companion guide to our annotated guide to the NSW privacy laws, PPIPA in Practice, which is now in its tenth year of publication, and is updated quarterly to reflect the latest case law. PPIPA in Practice incorporates interpretations of both PPIPA and HRIPA, from the more than 300 cases decided to date. While Untangling Privacy provides the handy navigation tool to steer you in the right direction towards finding the legislative provision most relevant to your circumstances, PPIPA in Practice then fleshes out the detail. Think of it like this: Untangling Privacy is your map, and PPIPA in Practice is the instruction manual to fly your plane. So now you can quickly figure out the answer to the question: Can we disclose this? 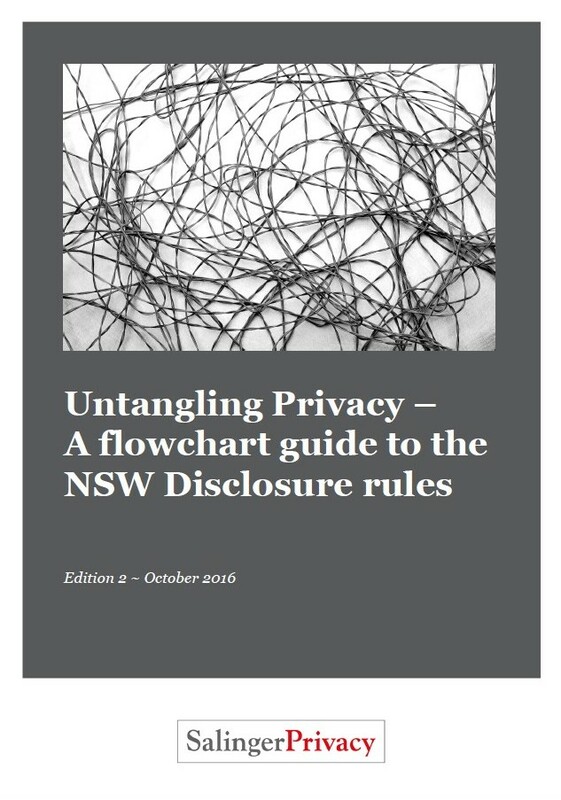 Click below to purchase Untangling Privacy – A flowchart guide to the NSW Disclosure rules. ‘Untangling Privacy’ offers a set of visual flowcharts to quickly guide you through the Disclosure principles – and all the exemptions to those principles – that apply in NSW. 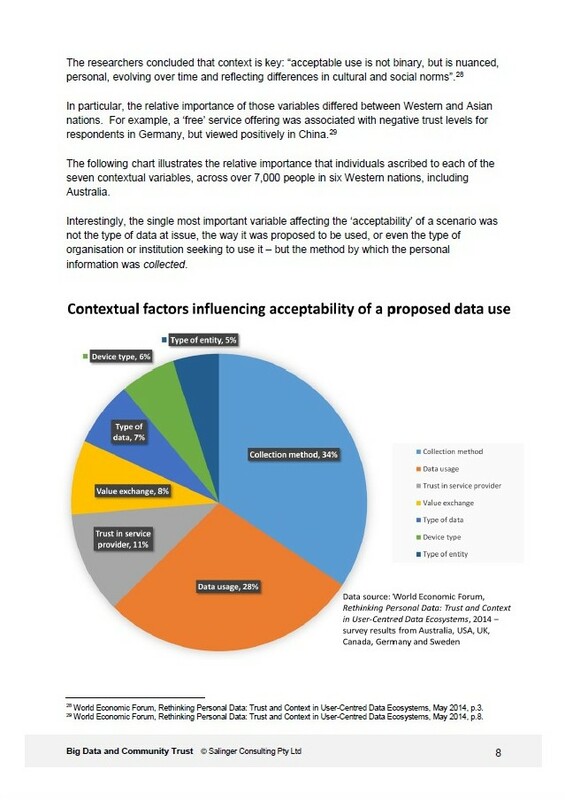 Can we realise the value of Big Data, but maintain our privacy too? In an information economy, data is the new gold. The computing analytics power of Big Data promises much, but its value cannot be realised without customer trust. Drawing together global research into the factors that influence customer trust, and our own experience guiding clients through advanced analytics and business intelligence projects, we have developed a framework to balance business objectives with legal and ethical concerns about Big Data. This eBook will guide you through how to build privacy protection in to your Big Data projects. 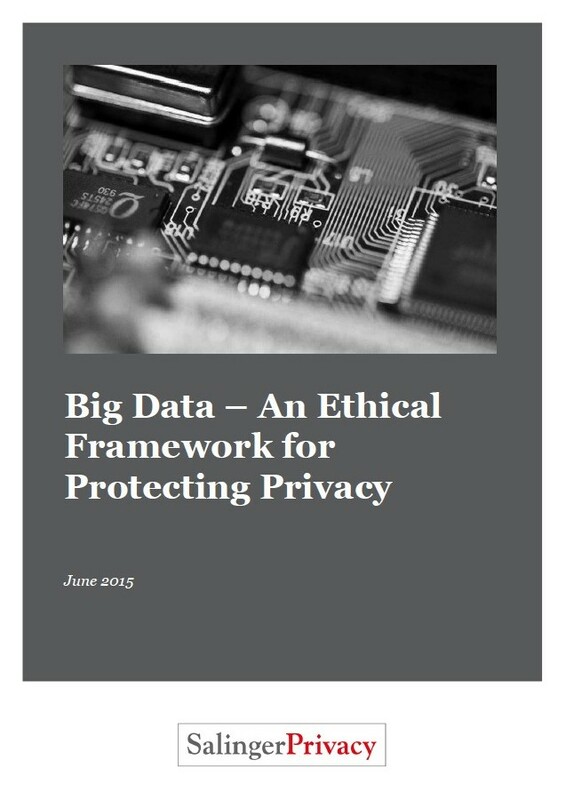 Click below to purchase Big Data – An Ethical Framework for Protecting Privacy. This guide offers practical insights into how organisations can engender customer trust, and thus allow the value of their Big Data projects to be realised. Need to understand NSW privacy law? Here is your bible. 415 cases read and annotated, and still going strong. Now in its 12th year of publication, PPIPA in Practice is our signature publication – available as a single-purchase eBook, or as an annual subscription with quarterly updates. PPIPA in Practice is a fully annotated guide to the Privacy and Personal Information Protection Act 1998 (NSW). ‘PPIPA’ is the key Act that applies to State government agencies, universities and local councils in NSW. It also includes all cases decided under the Health Records & Information Privacy Act 2002 (NSW), known as ‘HRIPA’, which applies to the private sector in NSW as well as public sector agencies. 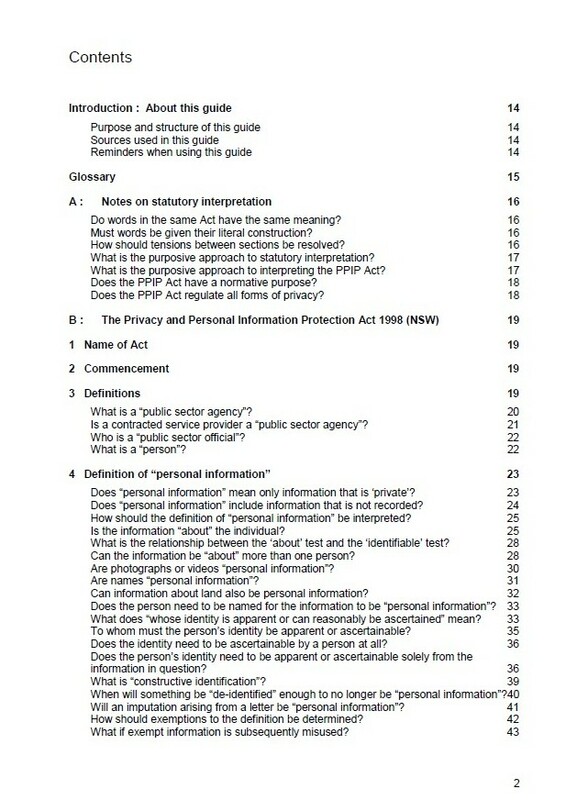 Whether you are a privacy officer needing advice, a lawyer advising a client, or a member of the public trying to frame a privacy complaint, PPIPA in Practice is designed to provide you with quick and comprehensive information about how each section of PPIPA (and HRIPA) are being interpreted and applied in practice. PPIPA in Practice brings together information and interpretations from over 400 NSW privacy cases decided since 2001, including seminal Court of Appeal cases. It also incorporates the Privacy Commissioner’s advice on the legislation, drawn from various guidelines, newsletters and submissions. The guide is constantly updated so you have the latest information available. what is included in the definition of “personal information”? are photographs or CCTV footage “personal information”? how does the “suitability for employment” exemption work? what form should a collection notice take? what are the “reasonable security safeguards” each agency needs to take? what do “express consent” and “implied consent” mean in practice? when will the “law enforcement” exemption apply? how much compensation can be paid for a privacy breach? … and plenty of uncommon questions too. 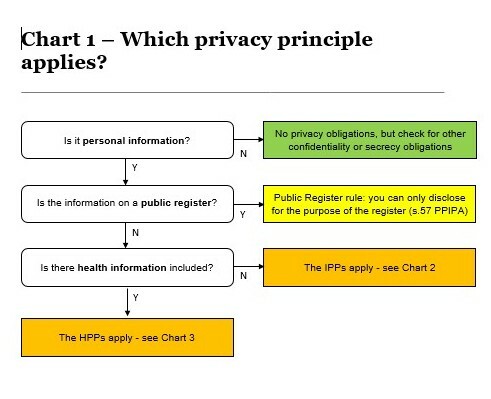 PPIPA in Practice also works as a companion guide to Untangling Privacy, our flowchart guide to the Disclosure rules that apply under NSW law. Click below to purchase the latest edition of PPIPA in Practice for $450 + GST, or contact us to arrange an annual subscription (four editions p.a.) for $900 + GST. Every employer in NSW, no matter how small, must comply with the NSW Workplace Surveillance Act. Revised in 2013 to incorporate the impact of the landmark ‘SF’ case regulating CCTV, Conducting Workplace Surveillance provides you with the advice you need: a clear, comprehensive, step-by-step guide to your obligations. Click below to purchase Conducting Workplace Surveillance. Does your organisation use CCTV, an email or internet monitoring system, or GPS in fleet vehicles? All employers in NSW need to understand their obligations under this legislation.